Heavy rain overnight and through the morning on the 27th had largely moved through by lunchtime but inevitably the blazing force 7 WSW wind was then an annoying consistent presence throughout; passerines were naturally in short supply but included a surprise Barred Warbler at Claypows (the last one was ten days ago, so possibly a new bird? ), a Siskin, 4 Lapland Buntings and 6 Snow Buntings. Other birds included 5 Red-throated Divers, a Great-northern Diver, 16 Sooty Shearwaters offshore in an hour, 61 Pink-footed Geese south, single Kestrel and Peregrine, a Jack Snipe with 278 Snipe and an Arctic Tern. Largely dry through the 28th with just a few showers but the strong winds were still a deciding factor; there were a few signs of some movements though with 4 Redwings (dark, coburnii looking birds), a big Common Redpoll of north-western origin, 63 Skylarks with a light southward passage, 8 Swallows, 280 Meadow Pipits, 7 Rock Pipits, 2 Lapland Buntings and 8 Snow Buntings. Other little bits included a Slavonian Grebe of The Links (only the second of the year), 3 Red-throated and 3 Great-northern Divers, 6 Whooper Swans south, 4 Pink-footed Geese, the first 3 Red-breasted Mergansers of the autumn, a Kestrel, a Merlin and an adult Arctic Tern off the north end. The westerly winds continued to blow on the 24th with the American Golden Plover still present around Holland the day’s highlight – there is some suspicion that it is in fact a different bird than the one that was present on the 19th and 20th but we’ll have to do some more examination of photographs to make a decision. Migrants across the land included a Sparrowhawk (only the second of the autumn), 2 Kestrels, 3 Merlin, 8 Rock Pipits, the Black Redstart, 20 Wheatears, a Song Thrush, a Blackcap, a Brambling, a Lapland Bunting and 5 Snow Buntings. An hour’s seawatch in the afternoon produced 8 Sooty Shearwaters and an adult Pomarine Skua while other birds included 4 Herons, 2 Jack Snipe, 230 Snipe and an influx of 18 Black-tailed Godwits. The strong westerlies were replaced by strong southerlies on the 25th which gradually increased through the day to become extremely strong by the afternoon which naturally limited what was seen out in the field today; the American Golden Plover was still present while most of the other interest was offshore with two hours seawatching producing 1,038 Fulmars (including two Blue Fulmars – the first of the autumn), 55 Sooty Shearwaters, 10 Manx Shearwaters, a juvenile Pomarine Skua, an Arctic Skua, an Arctic Tern and 2 Puffins. Other birds included single Red-throated and Great-northern Divers, 2 Kestrels, a Jack Snipe, a Common Sandpiper, a Willow Warbler, a Siskin, a Lapland Bunting and 6 Snow Buntings. Much lighter winds on the 26th but still barrelling in from the west, it was a quiet day with the American Golden Plover with 650 Golden Plover once again being the day’s highlight. Other bits of note included 17 Sooty Shearwaters in an hour in the morning, 2 Kestrels, a Merlin, a Grey Plover, a Redwing, 2 Willow Warblers, a Spotted Flycatcher and 4 Snow Buntings. The strong westerly airflow continued on the 21st but it remained largely dry, there were somewhat predictably few new arrivals on the land as birds included a Kestrel, a Sand Martin, 337 Meadow Pipits, 11 Rock Pipits, 24 Wheatears, a Redwing, a Blackcap, 2 Willow Warblers, a Spotted Flycatcher, 3 Siskins and 3 Snow Buntings. Wader and wildfowl totals comprised 5 Red-throated Divers, 215 Wigeon, 129 Teal, 16 Shoveler, 9 Tufted Duck, 3 Grey Plovers, 496 Golden Plover, a Ruff, 2 Jack Snipe, 178 Snipe and 5 Black-tailed Godwits. Similar again on the 22nd when landbirds included 2 Kestrels, 2 Merlin, 13 Rock Pipits, the Black Redstart, 2 Blackcaps, 6 Willow Warblers, the Common Rosefinch again at Holland, a Lapland Bunting and 2 Snow Buntings. A little look at the sea in the morning produced 6 Sooty Shearwaters, 2 Whooper Swans and 35 Pink-footed Geese while 8 Black-tailed Godwits, a Ruff and 4 Herons completed the noteworthy birds. Slightly lighter winds and some bright sunshine created a nicer day to be out in the field on the 23rd when birds across the island included a Merlin, a Short-eared Owl, 7 Rock Pipits, the Black Redstart, a Redwing, a Blackcap, 3 Willow Warblers, a Brambling, the Common Rosefinch again and a Snow Bunting. Other bits of note included 5 Red-throated Divers, 6 Pink-footed Geese, 5 Black-tailed Godwits, a Common Sandpiper which received some intense scrutiny and at least 10 Risso’s Dolphins moving down the east coast. Breezy through the day on the 18th but a pleasant day once the morning showers had passed through; a spread of Passerines were still present across the island, many of which were lingering birds but there was the odd thing sneaking in which included 6 Rock Pipits, a Robin, a Black Redstart, a Stonechat, 25 Wheatears, a Garden Warbler, a Blackcap, a Yellow-browed Warbler still at Holland, 3 Willow Warblers, 2 Bramblings and a Lapland Bunting. Also of note were 20 Pink-footed Geese south, a Kestrel, 2 Ruff and 4 Black-tailed Godwits. Bright and breezy first thing on the 19th with Storm Ali hitting us at lunchtime bringing force 8-9 SW winds and driving rain, essentially ending the day halfway through; the days highlight came just as the first raindrops were arriving with a smart adult AMERICAN GOLDEN PLOVER in fields around the surgery / Waterhouse area although when most of us caught up with it, it was already looking a big bedraggled, hunkered down against the rapidly increasing wind and driving rain. A few other birds were found just as the weather was hitting the island and included the first 2 Grey Wagtails of the autumn, a Yellow-browed Warbler at Senness where there was also single Pied Flycatcher and Spotted Flycatcher and a Common Rosefinch at Holland. Other birds across the land included the Black Redstart, the Obs Barred Warbler and a Lapland Bunting. Staring at the sea during the worst of the weather produced 15 Sooty Shearwaters, 3 Arctic Skuas and 18 Bonxies while wildfowl and wader totals included 8 Pink-footed Geese, 204 Wigeon, 114 Teal, 28 Mallard, 68 Ringed Plover, 692 Golden Plover, 60 Dunlin, 51 Sanderling, 193 Snipe, 5 Black-tailed Godwit, 88 Redshank and 132 Turnstone while 2 late Arctic Terns were at Bewan. Still extremely windy first thing on the 20th but the winds slightly eased and the day brightened up in the afternoon, the American Golden Plover was seen again the in morning but not subsequently while there was a nice spread of landbirds which popped back out as the weather improved which comprised 2 Kestrels, a Merlin, a Short-eared Owl, a Sand Martin, 7 Rock Pipits, the Black Redstart, a Redwing, 2 Barred Warblers (Obs and Holland), a Blackcap, a Siskin, the Common Rosefinch at Holland, the first Snow Bunting of the autumn at Gretchen and a Lapland Bunting. Other birds included 4 Whooper Swans, 16 Pink-footed Geese, 2 Jack Snipe, 8 Black-tailed Godwits, a Whimbrel and a little influx of 8 Black-headed Gulls. Bright and breezy on the 15th with little evidence of any new arrivals as migrant totals across the land included the Barred Warbler still at Obs, 2 Kestrels, 2 Merlins, a Peregrine, 404 Meadow Pipits, 3 Rock Pipits, the Black Redstart, one of the summering Fieldfares still, a Garden Warbler, a Blackcap and 6 Willow Warblers. Other little bits of note comprised 8 Red-throated Divers off Stennabreck and single Grey Plover, Ruff and Jack Snipe. A very difficult day on the 16th with a blazing force 8 southerly swinging round into the west, it certainly was tricky out in the field as the few birds unearthed included 5 Herons, 5 Pintail with 80 Wigeon, 2 Kestrels, a Merlin, 2 Peregrines, a lone juvenile Sand Martin, the Barred Warbler again at the Obs, 2 Willow Warblers and a Lapland Bunting on Trinley. A much nicer day on the 17th with lighter winds and some nice sunshine in the afternoon; most of the interest was offshore with two and a half hours seawatching producing single Red-throated and Great-northern Divers, 2,184 Fulmars, 22 Sooty Shearwaters, 3 Manx Shearwaters, 6 Storm Petrels, 2 Leach’s Petrels, 725 Gannets and 7 Common Scoter while a nice flock of 8 Whooper Swans flew south along with 32 Pink-footed Geese. On the land birds included single Kestrel, Merlin and Peregrine, a Ruff, 2 Jack Snipe, 2 Barred Warblers (at the Obs and possibly a new bird at Senness), 2 Willow Warblers and a Common Redpoll at the Obs. A very rough day on the 13th with strong westerly winds bringing heavy, nasty squalls across the island; the main feature of the day was a movement of 647 Pink-footed Geese south over the island with small flocks passing by throughout the day (the biggest flock of 220 rested for a time on Stromness Point), associated with these were a few Wigeon seen coming in from the north and a juvenile Scaup briefly on Brides Loch – the first of the year. 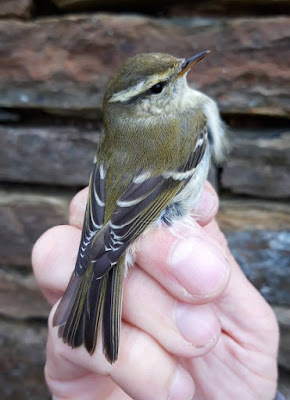 Passerines were limited to lingering birds which included 2 Sand Martins, 544 Meadow Pipits, a Rock Pipits, a Black Redstart, a Redwing, the Grasshopper Warbler near the lighthouse, a Barred Warbler at Brigg, a Yellow-browed Warbler at Holland, a Willow Warbler and a Brambling. Other birds of note comprised 6 Herons, 2 Kestrels, 2 Merlins (including one in off the sea from the north) and an adult and juvenile Common Tern in Nouster Bay – only the fourth record of the year. A nicer day on the 14th, still blustery with showers sweeping through but slightly calmer and the showers were further apart; a few Passerines popped up in the better conditions – probably all lingering birds which included a Lapland Bunting, 3 Yellow-browed Warblers (two at Holland and one at the surgery), 2 Barred Warblers (Obs and Holland), 3 Sand Martins, 5 Rock Pipits, a Robin, a Black Redstart, 59 Wheatears, 2 Sedge Warblers, a Lesser Whitethroat and a Willow Warbler. Other birds included the first Whooper Swan of the autumn in off the sea, 2 Kestrels, 2 Merlins, 2 Peregrines (including on over the Obs carrying at Kittiwake! ), a Grey Plover, 6 Ruff and 4 Black-tailed Godwits. There's always one lone, lost juvenile when the Pink-feet come through! A good autumnal feeling day on the 8th with light winds and misty murk coming and going through the day, it was just a shame that the wind had gone back into the NW; there was a good list of scarcities across the island through the day which included a Marsh Warbler trapped at Holland, 2 Barred Warblers (Obs and a new bird trapped at Holland), 2 Yellow-browed Warblers, 3 Common Rosefinches and the early first Brambling for the autumn. 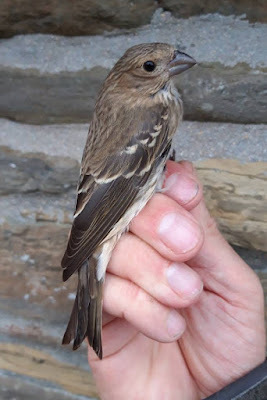 Other migrant totals comprised 2 Short-eared Owls, a Rock Pipit, the Black Redstart, a Redstart, a Whinchat, a Reed Warbler, 2 Lesser Whitethroats, a Garden Warbler, a Blackcap, 3 Chiffchaffs, 3 Willow Warblers and a Spotted Flycatcher. Also of note were 82 Wigeon and a little arrival of 14 Pintail, a Kestrel, 774 Golden Plover, a Grey Plover, a Ruff, 10 Black-tailed Godwits and a Whimbrel. A light southerly breeze started the day on the 9th but this soon became a brisk south-westerly, not usually our most profitable wind direction but there was again a nice selection of migrants across the island which included a Rock Pipit, the Black Redstart, a Redstart, 3 Whinchat, a Sedge Warbler, a Lesser Whitethroat, 2 Whitethroats, 3 Garden Warblers, 2 Blackcaps, the Greenish Warbler again which reappeared back at Dennishill, a Yellow-browed Warbler, a Chiffchaff, 8 Willow Warbler, 2 Spotted Flycatcher, a Pied Flycatcher and a single Common Rosefinch. Other little bits included the Buff-breasted Sandpiper still on Brides Loch, the first Jack Snipe of the autumn with an influx of 300+ Snipe, an increase to 8 Red-throated Divers, 3 Kestrels, a Ruff and 9 Black-tailed Godwits. A calm start on the 5th before a brisk southerly breeze picked up through the day; the Buff-breasted Sandpiper was still at Brides while a trickle of migrants across the land included an influx of 375+ Meadow Pipits, the first Reed Warbler of the autumn (and only second of the year! 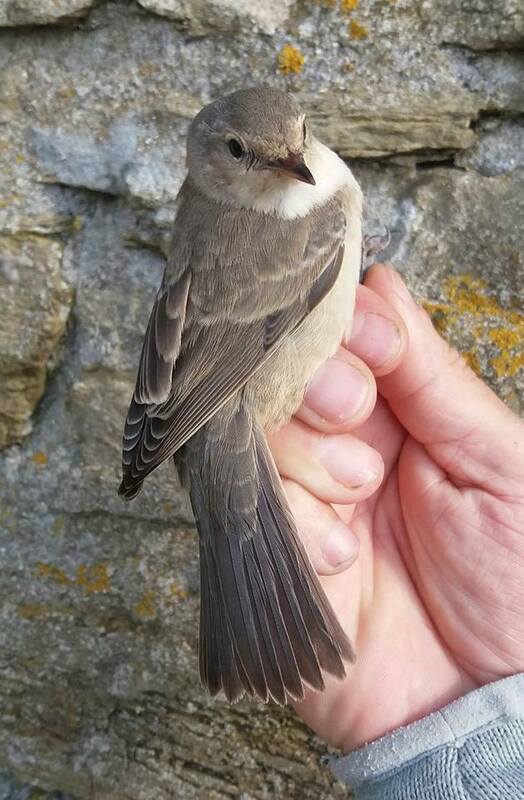 ), the Icterine Warbler again, a Garden Warbler, 2 Willow Warblers and a Common Rosefinch at the Obs in the evening. Other bits included an influx of 8+ Kestrels, single Merlin and Peregrine, a Grey Plover and 9 Black-tailed Godwits. A pleasant day on the 6th with a few little hints that we might be finally getting some migrants including a Pied Flycatcher, 4 Willow Warblers, a Lesser Whitethroat, 2 Barred Warblers (Obs and The Mill), the Icterine Warbler still, 2 Sedge Warblers and a Black Redstart. Elsewhere, counts included 78 Wigeon, 80 Teal, single Kestrel, Merlin and Peregrine and 11 Black-tailed Godwits. A fantastic day on the 7th with out autumn finally arriving with a bang and a host of new migrants across the island, the overnight rain lingered through until mid-morning but it wasn’t until the afternoon that birds started to be unearthed as it seemed that new birds kept arriving all the time. 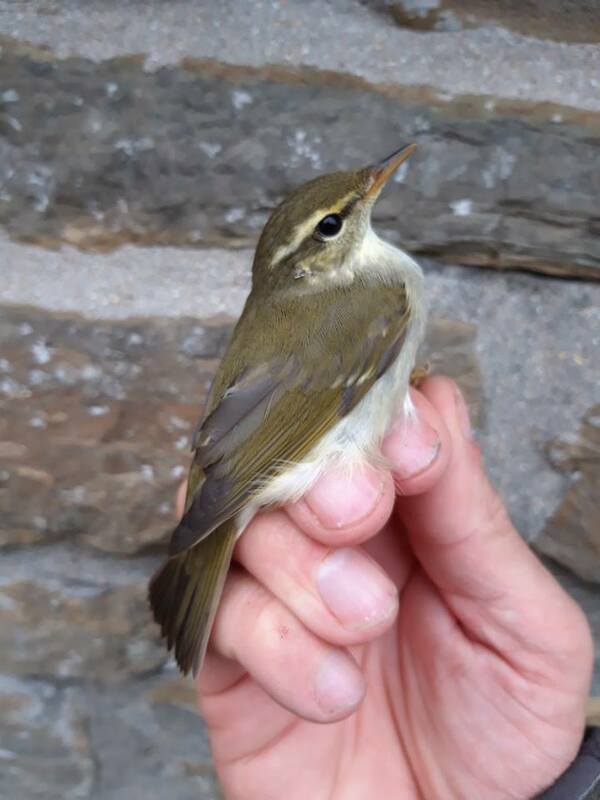 The highlights in summary included a GREENISH WARBLER at Bewan House, an ARCTIC WARBLER at Ancum Willows (about time after multiple birds just to the north of us! ), the first Wryneck of the year at Nether Linney, our earliest ever Yellow-browed Warbler at Westbeach, a Common Rosefinch, a Barred Warbler and the Buff-breasted Sandpiper at Brides still. 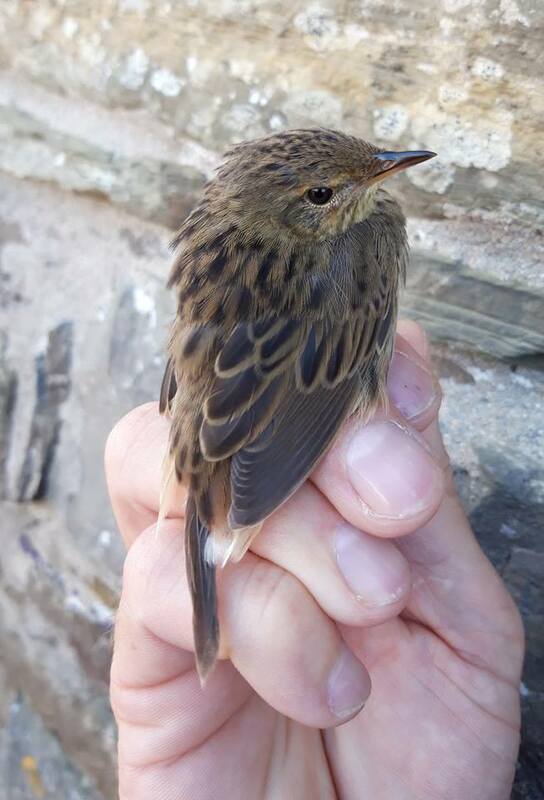 Other migrants across the land included 2 Kestrels, a Peregrine, 6 Sand Martins, 3 Tree Pipits and 3 Rock Pipits in amongst a big arrival of 655+ Meadow Pipits, 3 Redstarts, the first Whinchat of the autumn, a Reed Warbler, 3 Lesser Whitethroat, a Whitethroat, 8 Willow Warblers, the first 2 Spotted Flycatchers of the autumn and a Pied Flycatcher. Also of note were 4 Herons, 4 Ruff, 9 Black-tailed Godwits and a Whimbrel. 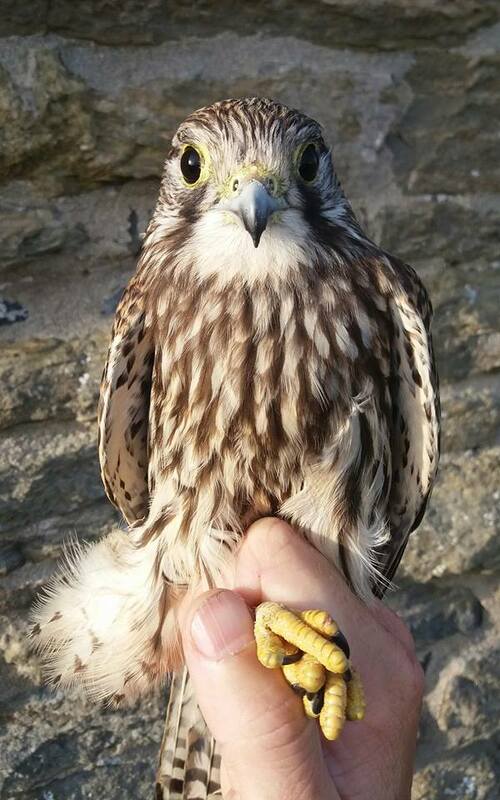 A nice day on the 30th with a light westerly breeze and plenty of sunshine; the highlights of a quiet day in the field came early on as we caught a smart young female Kestrel and a new Barred Warbler in the traps around the Observatory. Other birds of note through the day included a Hen Harrier, 3-4 Kestrels, a Merlin, a good count of 1,010 Golden Plover, 94+ alba Wagtails (including a good roost of 45 at the Obs), an influx of 133 Wheatears, the 2 Fieldfares and the Lesser Whitethroat again. A calm start on the 31st but the wind rapidly picked up to become a strong southerly by the afternoon, unlike elsewhere on the northern isles it was tough out in the field with little rewards as birds of note comprised 3 Herons, single Hen Harrier, Kestrel and Merlin, an influx of 170 Snipe with many small flocks buzzing around and a Black Redstart still around Holland. All change again on the 1st with fully overcast conditions and a very light and decreasing SW breeze; there was a nice range of species seen across the island but still quiet on the landbird front with the regular suite of raptors being joined by a 3cy Peregrine, a Tree Pipit, the Black Redstart, a Song Thrush and 8 Willow Warblers. Other birds of note included single Red-throated and Great-northern Divers, 4 Sooty and 16 Manx Shearwaters offshore, another trickle of ducks onto the island included 23 Wigeon, 4 Gadwall and the first Pintail of the autumn, 2 Grey Plovers again, 2 Ruff, 138 Snipe and 3 Black-tailed Godwits.